Great websites were the name of the game at Area 46’s club officer training, with Wessex Speakers shiny new website, fully equipped with new branding, as the star of the show. Lots of great tips were given on how to create an accessible, easy to maintain website. 82% of the UK population uses the internet, so it makes sense for us to have websites that shows us as we are – friendly people who are easy to find, all out to help each other develop communications and leadership skills. 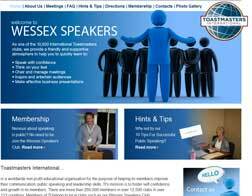 There are so many ways for clubs to get great websites – use a bespoke website like Wessex, use Easy Speak on the District 71 website, or the new FreeToastHost system. Don’t forget to use all the brilliant new branding materials on the Toastmasters Brand Portal.